approach to environmental management is imperative. The preservation of the environment is important to us and we at Stoddarts believe that a sustainable approach to environmental management is imperative. This commitment extends to ensuring that the company's operations make the most efficient use of natural resources and energy, and that our impact on natural ecosystems is minimal. Where possible, we will minimise our production of greenhouse gases, promote the use of renewable energy, and implement and promote environmentally friendly policies and structures. In addition, Stoddart's is committed to implementing best practice in environmental waste management. Window sizing and placement needs to be carefully considered in the design of any home to adhere to solar passive design principles. In addition to good design, energy efficient glazing can reduce heating and cooling costs to improve comfort and reduce electricity bills. 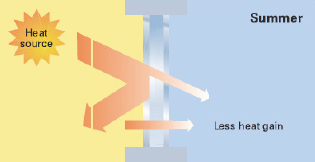 Double-glazed windows can reduce heat gain/loss by nearly 30% compared to single-glazed windows, along with reducing outside noise. 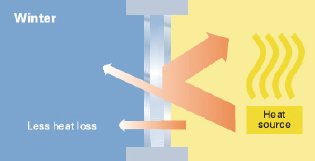 Triple-glazing has superior performance for use in cold climates. Coatings can be added to your windows as a cost effective way to improve energy efficiency. Examples include low-E coatings, toned glass and reflective coatings. Using timber in your home is the ultimate in sustainable building. It produces fewer greenhouse gases, generates less water and air pollution, and requires less energy to produce than alternatives. It also looks fantastic! or a mixture of these. While there are sustainability advantages to using timber; there are also many advantages to using aluminium windows and doors. High performance aluminium windows and doors with energy efficient glazing, can be as energy efficient as timber products. In addition to reducing heating and cooling costs, aluminium is a highly durable and low maintenance product. It does not require regular repainting or staining, which can save time and money. Aluminium is a cost effective product, and is available in any shape and size. It can be designed to match your selected décor (including colour matching to Colourbond products). For those who prefer the look of timber, timber-look aluminium products are available – arguably the best of both worlds.